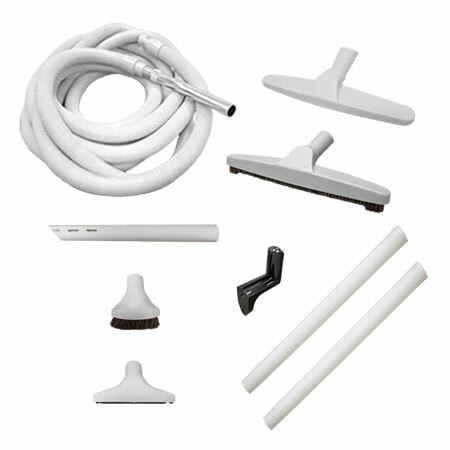 The Silver Smooth Floor Accessory Kit provides all of the components and attachments necessary to clean a home with smooth floors. The system is powered on when you plug in the hose and powered off when unplugged. The 12" smooth floor brush with natural bristles is used to clean hardwood, tile and other bare floors. The other attachments can be used to clean table tops, baseboards, upholstery and crevices. The hose hanger can be mounted in a closet or other area for storage of the hose. This package is for use with most inlets except for Kenmore, Sears and Budd.